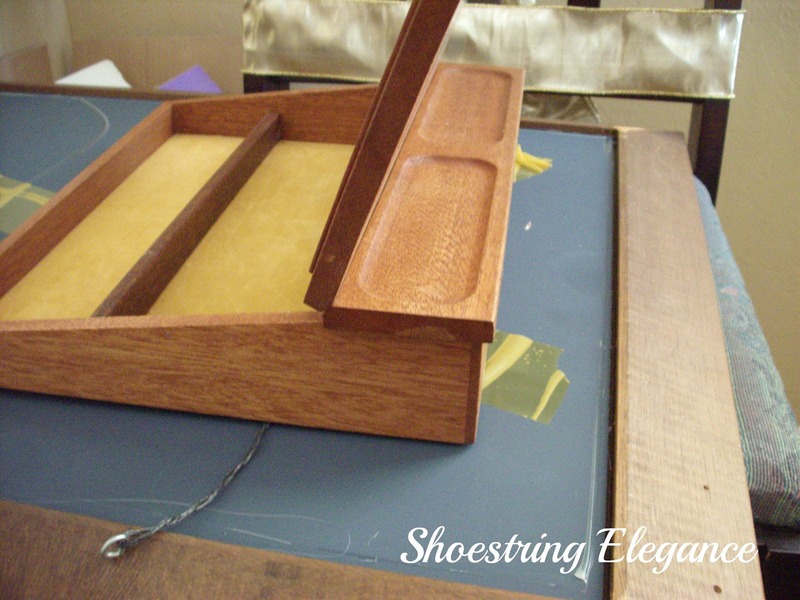 Shoestring Elegance: The Original "Lap Top"
Good Morning! Thanks for stopping by. I hope you all Had a great weekend! Okay, so I went“treasure hunting” again! Oh my goodness, did I ever find a treasure! When I first saw this Lap desk, I was completely unaware of it’s history, I just thought it would be something I would use alot and a great redo Item! Was I ever surprised when I looked up some history on it! (Prompted by my Mom, who said that this was what she had when she went to school, back in a little town called Harcourt in Canada). She looked it all over and said that it definitely was the same, so I looked it up. You gotta love Google!! It appears in the late 1800’s and early 1900’s school was not mandated by law, kids often had to work alongside their parents, for those towns that did hire a teacher to hold teaching lessons, they were usually held in a church or similar sized building. 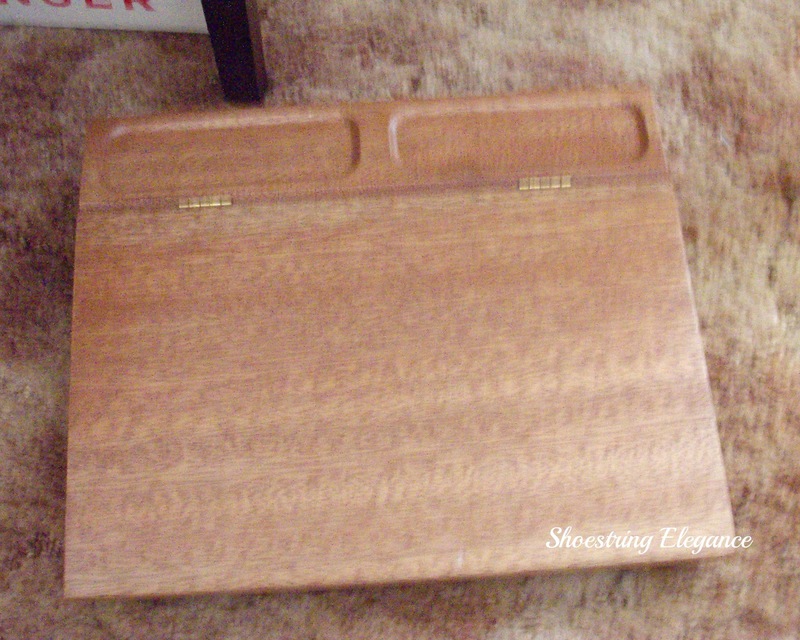 As this became more common, this lap style desk entered the picture. What fun! I simply thought I write a lot sitting on my couch, near my front window, and am always looking for a phonebook or something to put under my paper, won’t this be great?! Now, here’s the “shoestring’ part of it that you won’t believe, I got this piece for $4.00+ .50 for the paper I got @ Michael's and I had the paint. So I was able to have this beautiful treasure for a grand total of $4.50! I know most people don't like to mention how inexpensively their redo's are But I want everyone to know you can create some simple elegance in your own home! Thanks Patricia!! I appreciate your kind words and like mind! ~Theresa. What a neat find, and what you did with it is great!! Thank you all for such kind words..it means more than you know!! Thanks for hosting the Party! It was a great find and I do love learning anything new! Loved this one, loved your blog, Thanks again! ~Theresa. Beautiful old piece...Love its new look! Visiting from House of Grace. Hope you have a wonderful night! What a neat find! You definitely don't see those everyday. I love what you did with it, too, it looks so pretty. Hey Sharla and Cynthia! Thanks so much for coming by and your very kind words!! I'm glad you Liked it, it was a fun find!! I'll return the favor asap! Indeed you found a real treasure in that lap desk. Do not see many like that anymore. Hi, Meme!!! Thanks, that was what my Mom said, I hope you liked what I did with it. So honored to have you here for a visit! What a fun find and redo! @ Sis Sisters. Thanks so much for the invite!! 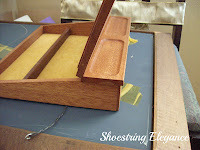 Just shared over at your Blog!! So glad you liked it! Thanks ~Theresa. @Katie, you are too sweet!! Thanks for having me! Gen, Thank you sooo much!! I really appreciate the Party and the Feature!! You are too kind! I'm so glad you liked it! It was a real informative and fun project to do! Virginia, you are too kind!! Thanks so much for your lovely comment. I agree, I want people to know how easily they can live a bountiful life regardless of their budget...Thanks!